Known for bars and restaurants, shimmering water and rich history, Key West is also famous for its brilliant sunsets. Visitors and locals alike gather to view the fiery sun as it descends on the horizon. Many of the island’s oceanfront resorts offer a nice view of the sunset, but when you’re ready to venture out, here are the best places to watch the Key West sunset. If you’re searching for an intimate spot to watch the sunset, look no further than the Tower Bar at Turtle Kraals. 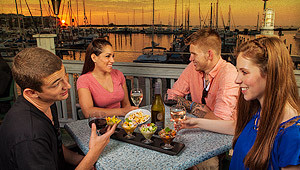 Overlooking Key West’s historic seaport on the water, the upstairs Tower Bar is the ideal place to relax, sip a drink and take in both the striking sunset and picturesque harbor views. 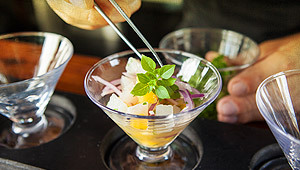 You might even sample some Peruvian-inspired ceviche sourced daily from the neighboring Half Shell Fish Market while you’re waiting for the sun to set. Bring your friends and family to the open-air Tower Bar, and enjoy a panoramic and unforgettable view of the sunset sky. 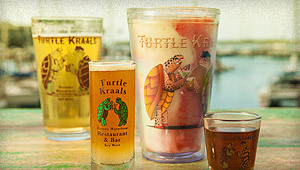 Turtle Kraals is located at 231 Margaret Street next door to the Half Shell Raw Bar. Mallory Square visitors don’t just watch the sunset, they celebrate it! Each night, a crowd gathers in Mallory Square to take part in the incredible, world-famous sunset celebration. Acrobats, musicians, psychics, artists, jugglers, magicians and many more showcase their skills in front of excited onlookers. In addition to celebrating the sunset, the event also highlights the island’s unique past, present and future. The party starts two hours prior to sunset, so arrive early and take in all the wonder of this one-of-a-kind cultural event. Mallory Square is located at 400 Wall St. just west of the northern end of Duval Street. Don’t want to watch the sunset from land? Head over to the historic seaport and climb aboard Fury’s Commotion on the Ocean, Key West’s only live music sunset sail. Once you’ve boarded Fury’s spacious catamaran, kick off your flip-flops and dance the night away. 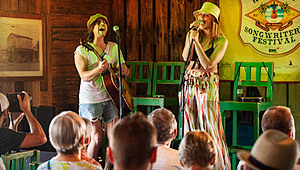 Local and national musicians entertain guests while the captain sails to the perfect spot for viewing the iconic sunset. 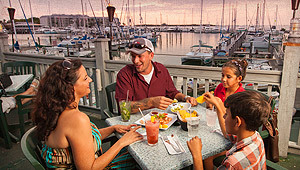 Enjoy complimentary beer, margaritas and appetizers with the sunset as your backdrop. Then, make a toast and look ahead to the next fun-filled day in island paradise. Whether you prefer a relaxing view of the sunset or a lively celebration, Key West is home to some of the most breathtaking scenery in the world. Don’t miss out on this truly awe-inspiring opportunity to witness the island’s natural beauty. As we say in Key West, see you at sunset!